With the public spotlight on food safety—and new U.S. laws restricting the use of antibiotics in animals raised for consumption set to take effect on Jan. 1, 2017—this is a pivotal point for meat and poultry producers. Industry leaders see the antibiotic-free movement as ushering in a new chapter in the annals of livestock agriculture. The new normal will be a vast departure from the past several decades, when adding low levels of antibiotics to livestock diets was considered the norm to prevent and treat disease and improve digestive health, thereby improving feed conversion and promoting growth. The practice came under scrutiny in 1969, when independent research commissioned by the British government, known as the Swann report, pointed to a potential link between antibiotics in animal feed and rising antibiotic resistance in humans. (Swann MM, Baxter KL, Field HI, et al. Report of the Joint Committee on the use of Antibiotics in Animal Husbandry and Veterinary Medicine. HMSO; London: 1969). Findings showed that routinely killing weaker germs enables stronger ones to thrive and multiply, creating the specter of a potential “superbug” outbreak in the human population. While there are other, unrelated causes for human antibiotic resistance, research over the years triggered consumer demand for antibiotic-free food items, a trend that shows no signs of abating. “Producers are facing a tough decision right now: Be part of this shift in production or be left behind as others start to make the change,” said Aidan Connolly, chief innovation officer at Alltech, a leading global animal health and nutrition company headquartered in Nicholasville, Kentucky. What exactly is the change? The general consensus is that “antibiotic-free” designates foods that were produced without the routine use of antibiotics in animals. In practical terms, it means that antibiotics (particularly those important for human health) were not added to an animal’s diet, nor were they widely administered to a flock or herd for disease prevention. Some restaurants and retailers take it even further with a “no antibiotics ever” policy, vowing that their poultry or meat comes from animals that were never given antibiotics under any circumstances, even a single dose to cure an illness. That, however, is the minority view and has drawn criticism from livestock health experts who believe in the humane treatment of animals who experience illness. The bottom line is that starting in January 2017 treatment of sick animals with antibiotics will require a prescription from a licensed veterinarian, and the use of important human antibiotics will not be allowed as growth promoters or for widespread disease prevention. As restrictions on use tighten around the world, the need for natural alternatives to maintain health and performance is growing. 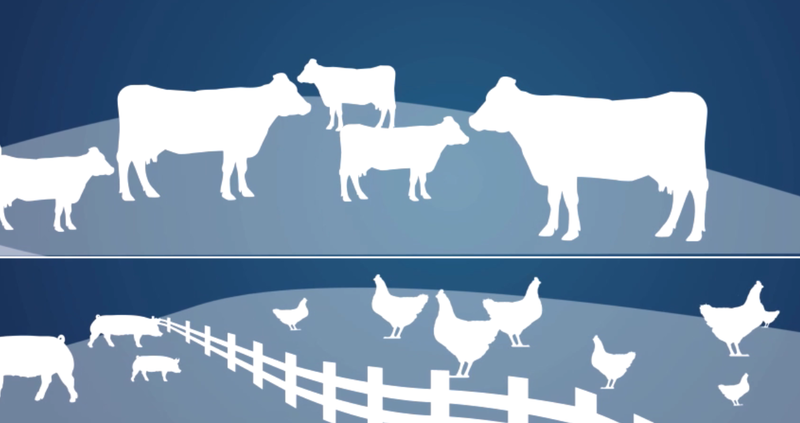 Watch an animated timeline showing the history of antibiotics in the food chain. From the discovery of penicillin in 1928 to current consumer concerns about the use of antibiotics in animal agriculture, the scene is set for a new period of change. Indeed, the year 2015 saw a tsunami of tide changes among producers and purchasers of poultry and meat. 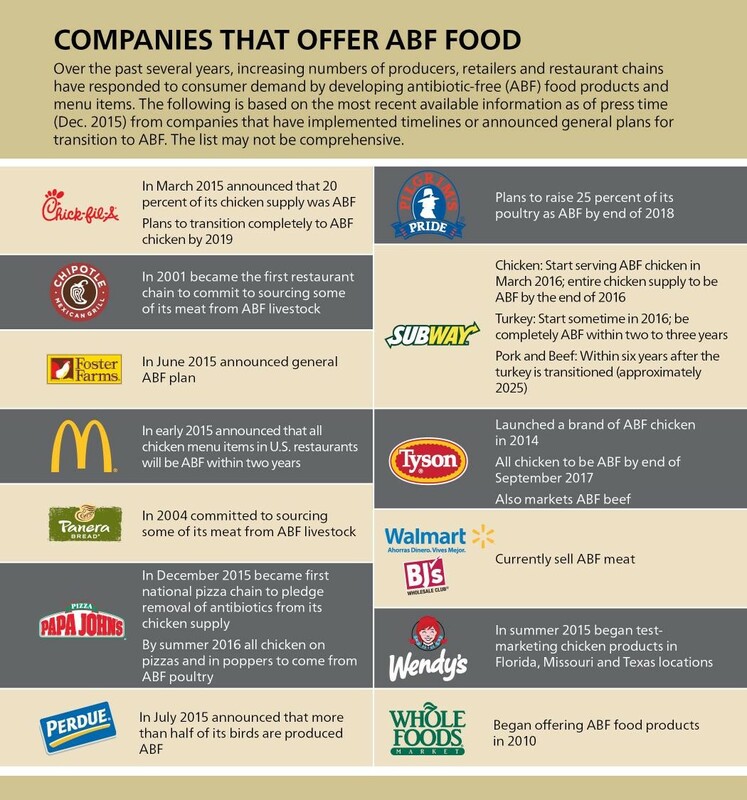 A growing share of broiler production began phasing out the routine use of antibiotics, and more and more antibiotic-free choices popped up on restaurant menus. The most recent was Papa John’s, which announced in December 2015 that chicken served on its pizzas and in its chicken poppers will come from birds never given antibiotics. The company expects to complete the transition by summer 2016. Papa John’s joins a list of restaurant chains committed to eliminate or reduce use of meat and poultry from animals fed or treated with antibiotics. Others to announce either a move away from all antibiotics or antibiotics used in human medicine include Chipotle, Panera Bread, Subway, Chick-fil-A, McDonald’s, Dunkin’ Donuts and Wendy’s. Not everyone, however, agrees on what “antibiotic-free” actually means. Under a strict reading, all food legally sold in the United States is antibiotic-free because it cannot contain traces of antibiotics when you buy it in the store or eat it in a restaurant. The underlying concern is how the food is produced—in other words, whether antibiotics were routinely given to the animals that end up on our dinner plates. The issue is not going to go away on its own. As the population burgeons, demand for meat and dairy products is expected to nearly double in the next 35 years. According to the United Nations Food and Agriculture Organization, meat consumption alone will increase by 73 percent over 2011 levels. That puts the onus squarely on producers and retailers, who will be called on to supply antibiotic-free products. Because it is produced in greater quantities and supplies are sufficient to meet current demand, chicken has been leading the charge. “Chicken is at its tipping point,” said Carey. Antibiotic-free, he added, “will be the paradigm for how broiler or turkey will be produced.” And with poultry paving the way, pork and beef are starting to pull up seats at the antibiotic-free table. Simply eliminating antibiotics from production animals will not in and of itself solve the problem of antimicrobial resistance, said Dawson. “We have these organisms in the environment. The damage has already been done out there. This tells us that it is time to raise the alarm,” he said. In Dawson’s view that means being forward-thinking by developing and implementing practices that keep production animals healthy, which reduces a need for antibiotics. That can start with steps as basic as improved farm hygiene and more biosecure animal housing, while bearing in mind that even the cleanest operations can still experience disease. Strategic nutritional management programs are an important component, as well. Among the alternatives to antibiotics are: direct-fed microbials, prebiotics and plant extracts. Alltech is ahead of the curve, having pioneered antibiotic-free technologies since the company was founded in 1980. This has led to new innovations backed by 733 published trials, resulting in multiple developments in the area of antibiotic-free production. Today’s Alltech Antibiotic-Free program provides a natural approach to help producers address the challenges that can occur in antibiotic-free production. The Antibiotic-Free program starts by supporting the animal’s immune and digestive system and allows for periods of adjustment. As the producer advances to the next level, the program helps provide a gut health management approach. This includes seeding the gut with favorable gut microflora, feeding the beneficial bacteria and maintaining a proper intestinal environment, and weeding out unfavorable microorganisms to support immune defense. The next step is the full Alltech Antibiotic-Free program, which provides a complete approach to animal well-being, including management, nutrition and technical support. The program supports animals with maximum health benefits through Alltech’s full range of technologies, allowing them to reach their genetic potential and producers to attain a sustainable and profitable future. “Our goal is to make sure producers have the right tools and resources necessary to make this transition as safely and profitably as possible, while still getting the consumer the quality product they want for themselves and their families,” said Connolly.